The Nighthawk X4 is a powerful router in all respects, especially when set up with a client that supports quad-stream 802.11ac – but that power certainly comes at a price. The Netgear Nighthawk X4 is a quad-stream 802.11ac router promising faster wireless speeds than we've seen so far from triple-stream routers. Technically, 802.11ac allows for up to eight separate 5GHz wireless streams, each of which can send data at 433Mb/sec. 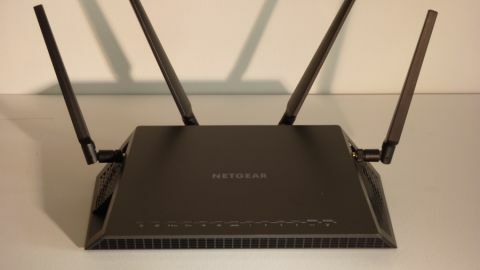 With three antennas, a router can offer a theoretical maximum of 1300Mb/sec, as long as a connected client similarly has a triple-stream 802.11ac receiver. This speed is already far superior to the maximum transfer rate of 802.11n wireless, but with the extra channel, you should expect even faster speeds, up to 1733Mb/sec. Combined with improved 600 Mb/sec 802.11n wireless, its powerful 1.4GHz dual-core processor, twin USB ports and an eSATA port, the Nighthawk X4 is a seriously powerful piece of home networking kit. But it carries a high premium – retailing for £230 (around $360, or AU$460) it's one of the priciest 802.11ac routers you can buy (though you can, as ever, get it cheaper if you shop around online). So, is the extra speed and performance worth it? The Nighthawk X4 looks almost exactly like the original Nighthawk model, save for the addition of an extra antenna. It uses the same black, angled design, with only a few subtle differences. The antennas are now positioned around the unit, possibly for better performance, and this gives the router a look almost like a robot, with arms on each side. It stands out, and is a whole lot better than the boring box designs that have been endlessly recycled by networking firms for what seems like forever. As before there are a large number of LEDs at the front, 13 in total, to relay status information to the user. Most of the time, it feels like overkill, with so many lights flashing on and off, but they can be turned off, which is preferable if you want to leave the Nighthawk X4 in a corner and not get in the way. Inside, the 1.4GHz processor is quite a boost from the 1GHz processor inside the original Nighthawk. Additionally, there's a separate "offload" processor that runs at 500MHz to handle additional functions. Of course, as well as the four 5GHz 802.11ac streams, the Nighthawk X4 works just fine if your laptop or USB wireless adaptor only supports fewer streams, 802.11n, or earlier standards. The AC2350 figure is rounded up from the 1733Mb/sec of 802.11ac combined with the 600Mb/sec enhanced 802.11n performance. A subtle change has been made to the positioning of the USB 3.0 ports, which are both now located on the left-hand side, with an eSATA port on the right. With three storage expansion options, Netgear is describing the Nighthawk X4 as Network Storage Ready on the packaging, quite an interesting claim, since the file management functionality built into most router software is often severely lacking. The software is just about the same as before. Netgear's interface has a rather sparse look to it, not helped by the prevalence of white in its visual design. Compared with the software on the Asus RT-AC68U, it looks plain boring, but it's certainly not lacking in features. One new addition is an improved QoS setting, which can run a bandwidth check on speedtest.net directly from the router, and can retrieve device information from a database to make a better judgment on the speeds it should allocate. The ReadyShare section, for managing clients and shares on connected USB devices, is fairly good too, although it still doesn't quite match a dedicated NAS. However, while power users like to tinker with every setting to squeeze as much performance as possible from routers, in Netgear's own survey, the company found, on average, only 6% of users ever bother to log in to a router's on-board software. While the number is likely to be higher for more savvy users who purchase a high-end model such as the Nighthawk X4, the overall focus is now on mobile and desktop apps that can be used to control a router, as it's so much easier than having to log in via a browser. Netgear's Genie software fills this requirement, with versions for iOS and Android as well as Windows desktop software. It doesn't provide access to every setting – users who are more likely to use mobile software to control a router might not need access to its advanced features, but for general use it provides much of the same information. It's okay, but there's a lot of room for improvement. The iOS version crashed once in use, and like the on-board software, doesn't have a particularly pleasing aesthetic style. It looks a bit naff, in truth. There's so much untapped potential for networking companies to create amazing mobile apps, it's a shame Netgear (and others) haven't put in the real effort to make them work. But looks can be deceiving and the on-board software is still reasonably good. Setup is particularly simple. You log in by entering www.routerlogin.net into a browser, and the router automatically configures itself, including downloading any firmware updates.